It was a very lucky day for us when we attended the Firth dispersal sale in 2002. Having gone really to look and no more, we ended up buying what must be the most well known Firth pony in the UK, namely Firth Gold 'n' Ivory. Although an old boy now, he has won many Championships in his time and has sired some outstanding stock. He is now retired from stud duties although when Spring comes around there is no doubt in his mind that he is a youngster again! We currently have two of his sons in the stud, Firth Zanzibar (see below) and a home bred one Athabasca Prancer (also lower down this page). Ivory has the most outstanding temperament, is a great character and we feel very priveleged to have had the chance to own this wonderful pony. The spitting image of his sire Firth Gold 'n' Ivory, Zanzibar came to us via a circuitous route. We saw him first at Reading Spring Sale in 2005 and tried to buy him but were unsuccessful and he was exported to Holland. Then in January 2006, we attended the Dutch Stallion Show and saw him again. Seizing our chance we managed to secure his purchase and he was on his way back to the UK again. 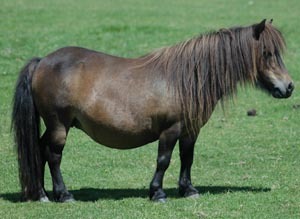 He is a lovely pony with the same laid back temperament of his sire and that typical characteristic of the Firth ponies, lots of mane and tail. Prancer is our home bred colt by Firth Gold 'n' Ivory. He is very well bred on his dam's side, including some of the best Kerswell bloodlines. 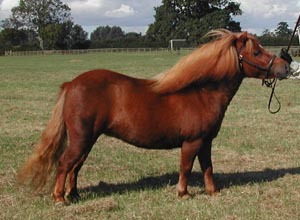 He was shown as a yearling winning many classes, Junior Championships and a Reserve Overall Championship. Due to our move to Scotland to build a house he has not been shown since although we hope to do so soon. 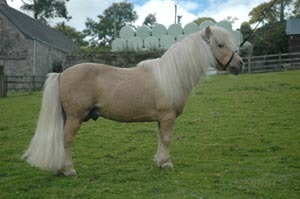 Poppy is one of four miniature mares in the stud all of which were chosen for either their Firth or Kerswell bloodlines. Her dam, New Park Momento who was also with us for a number of years is now happily retired and living with our farrier in Devon, Mr Paul Middleton. 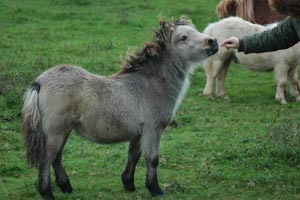 Poppy has produced two very good foals for us, Athabasca Prancer and Athabasca Phoebe (both on this page). She is one of the great characters of the stud, always amusing and very independent. Olivia was purchased by us a three year old at Reading Sale. We specifically wanted her as she carries both Kerswell and Firth bloodlines. 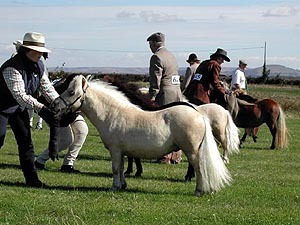 As a four year old we took her to the Society Breed Show in Yorkshire and from a large entry of 28 miniature yeld mares she won first prize. We have not shown her since. She produced a very nice palomino colt by Firth Gold 'n' Ivory called Athabasca Orcadian. Phoebe is a full sister to Prancer and is being retained by the stud. She has a very cheeky temperament and bosses all the big standard fillies around. She is a very unusual colour being a dilute bay. 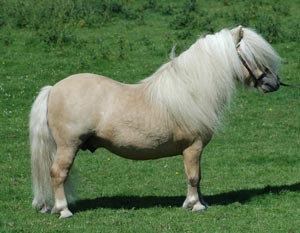 In the summer months her body colour is almost cream with dark points and a salt and pepper mane and tail.